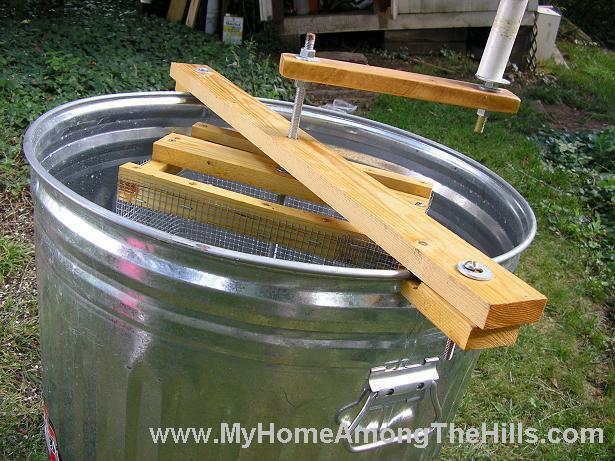 When I first started beekeepeing, I decided to build my own honey extractor. 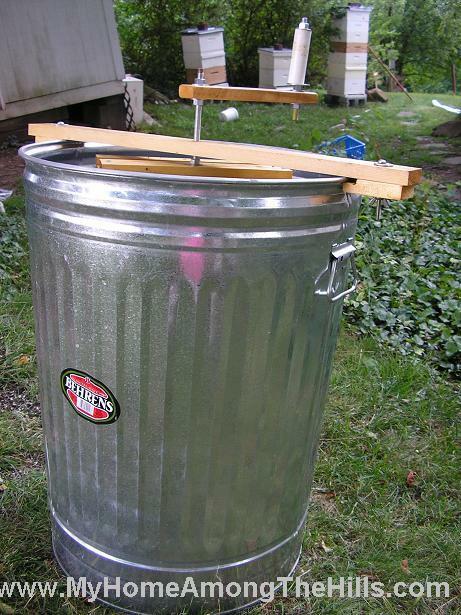 This is hand built from a NEW trashcan and was coated with Cam-kote food grade paint. It is a lot of work to use but it definitely works. A person could gear the drive or (as I did) chuck the spindle in the middle with a drill and let it do the work. It’s hard on a drill with a load of honey but will work pretty well. Some have asked what the metal rod sits on in the bottom of the can…I added a nylon cap to the end of the rod. It rides in a nylon bushing attached to the can. You can mess around at your local hardware store and find nylon bushings and washers and the like. They are pretty tough and will keep metal shavings from getting into your honey. That’s pretty slick! Good work. Am enjoying your blog thoroughly. All your buzz-honey posts make me miss my beekeeping days. My hives were destroyed by a hurricane storm surge in 2005. Sort of glad I did not start them up again, as we had another surge this past September. I’ll have to enjoy beekeeping vicariously through your posts. Great blog! Thanks BW. Sorry to hear you lost hives due to hurricane activity. I’ve often wondered what folks along the coastal regions do. Anyhow, I will certainly be posting a lot on bees this spring and summer…it’s not far off now! Love your blog. 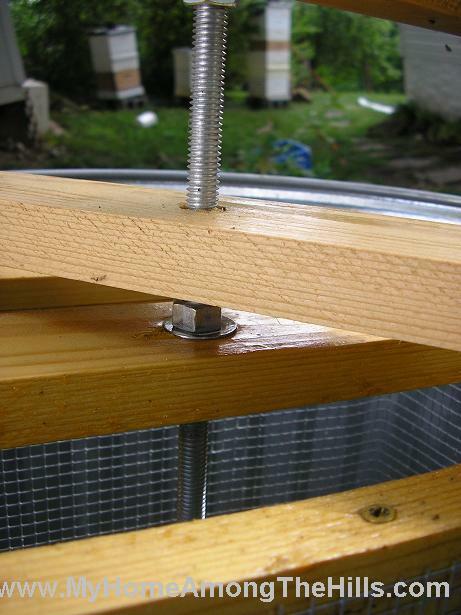 I’m trying to get into beekeeping on the cheap, and am planning to build a copy of your honey extractor. I have one question though – how do you keep the frames from falling toward the middle before you start spinning them? Great question Tim…it’s the same problem that most tangential extractors have…even the “real” ones. In general, it is a bit like magic…we tilt them just a little and sort of hold them for a second while we start spinning. As soon as there is any motion, of course, they stay in place. Most times, though, a slight tilt will hold them just fine! Great idea building it out of wood! I did not see a spigot on the can, so I assume you just pour the honey out the can, right? Also, in response to Tim’s comment, it would be very easy to add a 1-1.5 inch pivoting wood latch on the top to hold the frames in place before cranking. Tom – right on both accounts though it would be simple to add a spigot too. 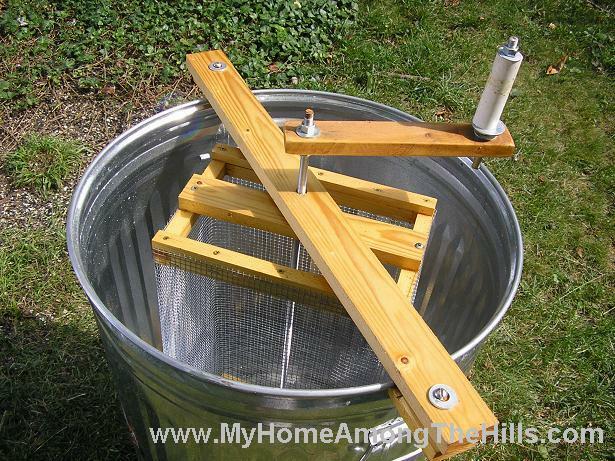 Most of the beekeeping supply places sell honey gates for that very purpose! I too love the trash can extractor. I would like more information about the internal parts and pictures. Thank you and happy beekeeping. sir, first of all great idea for the honey centrifuge. all i have is one queery. the main shaft arrives till the end of the cage (where you put the frames) or it keeps on going down to the end of the bucket. if you want to watch my maltese bees feel free to do so. sorry for the mess since i was a beginner at that time. The shaft continues through the basket and rests on the bottom of the container. 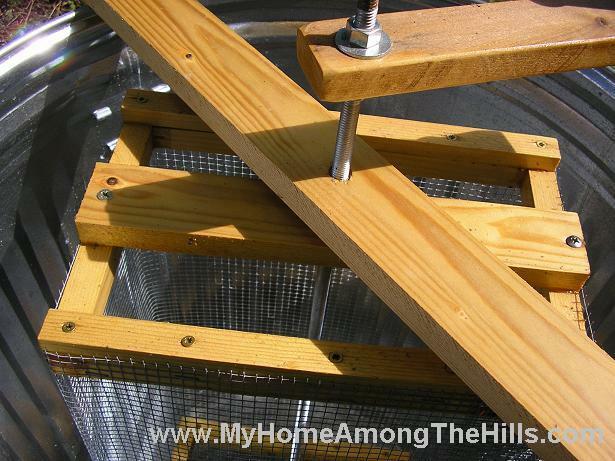 It has to be that way to hold the basket out of the extracted honey. 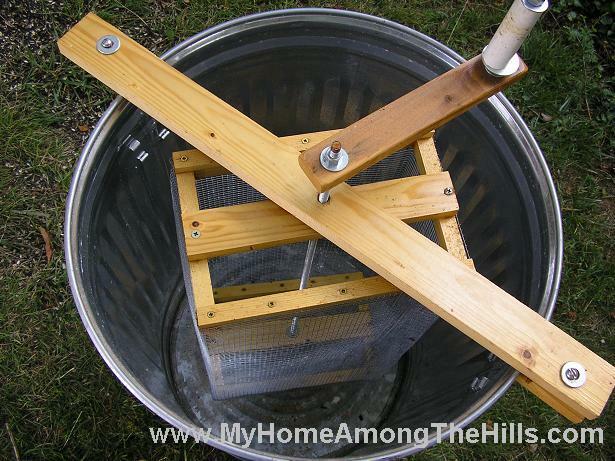 Turning the basket itself through extracted honey would be very difficult. By the way, I enjoyed your video also! I bought mine from ebay, but sad to say it didn’t have a warranty and it got broke. Anybody know someone who can fix it? I’d been puzzling over this very question.